Combination vaccines improve coverage, compliance and effectively introduce new antigens to mass vaccination programmes. This was a phase III, observer-blind, randomized study of GSK Biologicals diphtheria-tetanus-whole cell pertussis vaccine combined with hepatitis B and Haemophilus influenzae type b vaccines, containing a reduced amount of polyribosyl-ribitol-phosphate (PRP) and a DTPw component manufactured at a different site (DTPw-HBV/Hib2.5 [Kft]). The primary aim of this study was to demonstrate that DTPw-HBV/Hib2.5 [Kft] was not inferior to the licensed DTPw-HBV/Hib (Tritanrix(tm)-HepB/Hiberix(tm)) vaccine or the DTPw-HBV/Hib2.5 vaccine, also containing a reduced amount of PRP, with respect to the immune response to the PRP antigen, when administered to healthy infants, according to the Expanded Programme for Immunization (EPI) schedule at 6, 10 and 14 weeks of age. 299 healthy infants were randomised to receive either DTPw-HBV/Hib2.5 [Kft] DTPw-HBV/Hib2.5 or DTPw-HBV/Hib according to the 6-10-14 week EPI schedule. Blood samples were analysed prior to the first dose of study vaccine and one month after the third vaccine dose for the analysis of immune responses. Solicited local and general symptoms such as pain, redness and swelling at the injection site and drowsiness and fever, unsolicited symptoms (defined as any additional adverse event) and serious adverse events (SAEs) were recorded up to 20 weeks of age. One month after the third vaccine dose, 100% of subjects receiving DTPw-HBV/Hib2.5 [Kft] or DTPw-HBV/Hib and 98.8% of subjects receiving DTPw-HBV/Hib2.5 vaccine had seroprotective levels of anti-PRP antibodies (defined as anti-PRP antibody concentration ≥0.15 μg/ml). Seroprotective antibody concentrations were attained in over 98.9% of subjects for diphtheria, tetanus and hepatitis B. The vaccine response rate to pertussis antigen was at least 97.8% in each group. Overall, the DTPw-HBV/Hib2.5 [Kft] vaccine was well tolerated in healthy infants; no SAEs were reported in any group. The DTPw-HBV/Hib2.5 [Kft] vaccine was immunogenic and well-tolerated when administered according to the EPI schedule to Indian infants. Combination vaccines improve individual compliance and vaccination coverage and offer a convenient vehicle for introducing community protection against new diseases by adding antigens to an existing vaccine with high coverage [1, 2]. The diphtheria-tetanus-whole cell pertussis (DTPw) is one such vaccine, with a global coverage of 81% in 2007 . In 1996, GlaxoSmithKline (GSK) Biologicals licensed the first combined DTPw and hepatitis B vaccine (DTPw-HBV, Tritanrix(tm)Hep B), which was shown to improve the uptake of hepatitis B vaccine in Thailand . Haemophilus influenzae type b (Hib) protection was added via the monovalent vaccine, Hiberix(tm) to form DTPw-HBV/Hib. This combination vaccine facilitated the introduction of hepatitis B and Hib vaccinations to large parts of the developing world . Increasing global demands for DTPw-based combination vaccines has necessitated creative strategies to ensure the adequate supply of the vaccine antigens, through reducing Hib antigen content and expanding antigen production at new manufacturing sites. Primary vaccination with reduced Hib content vaccines has been shown to confer vaccine response rates, after primary vaccination, at least as high as those observed with commercially available DTPw-HBV/Hib containing 10 μg PRP [6, 7]. DTPw-HBV/Hib2.5, which contains a reduced amount of the purified polyribosyl-ribitol-phosphate capsular polysaccharide (PRP) of Hib covalently bound to tetanus toxoid has been subsequently developed. Furthermore, a formulation of this vaccine [(DTPw-HBV/Hib2.5 [Kft]; Zilbrix(tm)-Hib)] manufactured at a new production site in Hungary and represented by 'Kft' has been introduced. The primary aim of this study was to demonstrate that (DTPw-HBV/Hib2.5 [Kft]) was not inferior to the licensed DTPw-HBV/Hib (Tritanrix(tm)-HepB/Hiberix(tm)) vaccine or the DTPw-HBV/Hib2.5 vaccine with respect to the immune response to the PRP antigen, when administered to healthy infants according to the Expanded Programme for Immunization (EPI) schedule at 6, 10 and 14 weeks of age. The DTPw-HBV/Hib2.5 [Kft] differs from the other two vaccines in the study as it has components manufactured at a site in Hungary. This phase III, observer-blind, randomized, primary vaccination study took place at three centres in India between June 2007 and January 2008. The trial followed the principles of the Declaration of Helsinki, and was compliant with the international standards of Good Clinical Practice and the local Indian Council of Medical Research guidelines governing clinical trials . The study protocol was approved by the office of the Drugs Controller General of India (DCGI). The protocol was also subject to an institutional ethics committee review at each centre. Additionally, the study processes were subject to a sponsor audit without any critical findings. Written, informed consent was obtained from parents/guardians before enrolment. Healthy infants aged 6-8 weeks who had received one dose of the Hep B vaccine within one week of birth were randomised to receive the DTPw-HBV/Hib2.5 [Kft], DTPw-HBV/Hib2.5 or DTPw-HBV/Hib vaccines at 6, 10 and 14 weeks of age by intramuscular injection in the thigh. The diphtheria and tetanus antigens of the DTPw-HBV/Hib2.5 [Kft] vaccine were produced at GSK Biologicals, Korlatolt Felelossegu Tarsasag in Hungary, all other components of this, and the other vaccines, were developed and manufactured by GSK Biologicals, Rixensart, Belgium. The pertussis components were produced by the Commonwealth Serum Laboratory in Australia. All vaccines contained: at least 30 international units (IU) of diphtheria toxoid, 60 IU of tetanus toxoid and 4 IU of Bordetella pertussis (BPT), killed; and 10 μg of hepatitis B surface antigen (HBsAg). The study vaccine, DTPw-HBV/Hib2.5 [Kft] and the comparator DTPw-HBV/Hib2.5 both contained 2.5 μg of the H. influenzae type b capsular polysaccharide conjugated to 5-10 μg of the tetanus toxoid, compared to 10 μg of the H. influenzae type b capsular polysaccharide conjugated to 20 to 40 μg tetanus toxoid in the DTPw-HBV/Hib vaccine. Blood samples were collected before the first dose of study vaccine and one month after the third vaccine dose and were tested for antibodies against all vaccine antigens, using enzyme-linked immunosorbent assays (ELISAs). Anti-PRP antibodies were measured by ELISA with a cut-off set at 0.15 μg/ml. Anti-diphtheria and anti-tetanus antibody concentrations were measured by ELISA with an assay cut-off set at 0.10 IU/ml. Subjects seronegative for anti-diphtheria antibodies by ELISA were re-tested with an in vitro neutralization assay on Vero cells (cut-off of 0.016 IU/ml). Anti-HBs antibodies were determined using either a commercial radioimmunoassay (AUSAB, Abbott), an ELISA developed in house or combination of the two, with an assay cut-off set at 10 mIU/ml. Seroprotection was defined as antibody concentrations greater or equal to the assay cut-off. Anti-whole-cell-Bordetella Pertussis (BPT) antibody concentrations were measured by ELISA (AniLabsystems) with an assay cut-off set at 15 ELU/ml. Reactogenicity was assessed using diary cards during a 4-day follow-up period after each vaccination. Reports of local symptoms of pain, redness and swelling at the site of injection, and of general symptoms of drowsiness, fever (defined as an axillary temperature ≥37.5°C), irritability and loss of appetite were actively solicited. Symptom intensities for pain, irritability, drowsiness and loss of appetite were graded by the investigators on a three point scale. Grade 3 was defined as: cries when limb is moved/spontaneously painful (pain); diameter > 20 mm (swelling and redness); interfering with normal activities (other symptoms). Unsolicited symptoms were recorded during the 30-day follow-up period after each vaccine dose and serious adverse events (SAE) were recorded throughout the duration of the trial. The primary objective of the study was to sequentially assess and check the non-inferiority of the DTPw-HBV/Hib2.5 [Kft] vaccine versus first DTPw-HBV/Hib and then DTPw-HBV/Hib2.5, in terms of the anti-PRP antibody response, after a three-dose primary vaccination course administered to healthy infants at 6, 10 and 14 weeks of age. The analysis of immunogenicity was based on the according to protocol (ATP) cohort for analysis of immunogenicity, which included all evaluable subjects for whom at least one measurement for the immunogenicity endpoint measures were available and who followed the study procedures. Evaluable subjects were those that met all the eligibility criteria, complied with the procedures defined in the protocol and were not eliminated from the study. It was calculated that a sample size of 90 evaluable subjects per group would provide an overall power of 92% to meet the non-inferiority criteria for both the primary endpoints assuming the groups elicited identical immune responses. Allowing for an attrition rate of 10%, a target sample size of 300 subjects (100 subjects per vaccine group) was selected. Antibody seroprotection rates were calculated with 95% confidence intervals (CIs) one month after the third vaccine dose. Geometric mean concentrations (GMCs) were calculated by taking the anti-log of the mean of the log concentration transformations. Antibody concentrations below the cut-off of the assay were given an arbitrary value of half the cut-off for the purpose of GMC calculation. As there is no established correlate of protection against pertussis, a vaccine response was defined as the appearance of antibodies in initially seronegative subjects, or maintenance or increase of pre-vaccination antibody concentrations in subjects that were seropositive prior to vaccination, taking into account the decline of maternal antibodies. All CIs calculated were 2-sided and computed using Proc StatXact SAS 9.1 and Proc StatXact 5 procedure on SAS. Non-inferiority was considered to be reached if the upper limit of the two-sided 95% CI, for the differences in the percentage of subjects with anti-PRP antibody concentrations of ≥0.15 μg/ml, was below the pre-defined limit of 10% one month after the 3rd vaccine dose. Additional exploratory analyses of seroprotection using 95% CI on differences in seroprotection or vaccine response rates or ratios of GMCs between the study vaccine and comparator groups were undertaken. The safety analysis was based on the Total Vaccinated Cohort. The incidence of solicited local and general adverse events (any or grade 3 intensity) was calculated using exact 95% CI. Exploratory analyses were used to compare the incidence of solicited symptoms between the groups. The standardized asymptotic 95% CI for the difference between groups was also computed (StatXact 7) for the occurrence of solicited symptoms (during the 4-day follow-up period) after each vaccine dose, and overall per dose and per subject. CIs excluding zero indicated that a difference between groups may exist. A total of 300 subjects were recruited, of whom 299 subjects were vaccinated and included in the total vaccinated cohort and 267 were included in the ATP immunogenicity cohort of subjects (Figure 1). There were no withdrawals due to adverse events and 273 subjects completed the study. The demographic characteristics of the subjects in the three groups were similar (Table 1). Distribution of subjects (CONSORT diagram). One month after the third vaccine dose, all subjects vaccinated with DTPw-HBV/Hib2.5 [Kft] and DTPw-HBV/Hib and 98.8% of those vaccinated with DTPw-HBV/Hib2.5 had seroprotective levels of anti-PRP antibodies across all three groups (Table 2). The upper limit of the 95% CI for the difference between groups in the percentage of subjects with seroprotective anti-PRP antibody concentrations (≥0.15 μg/ml) was below the pre-defined limit of 10%. Thus the study vaccine, DTPw-HBV/Hib2.5 [Kft], was shown to be non-inferior to the two comparator vaccines. N = total number of subjects; CI = confidence interval; GMC = geometric mean concentration. In all three groups, seroprotective antibody concentrations were attained in 100% of subjects for diphtheria, tetanus and hepatitis B one month after the vaccination course. The vaccine response rate to the pertussis component, at the same time point, was at least 97.8% in each group (Table 3). BPT = Bordetella pertussis; CI = confidence interval; GMC = geometric mean concentration; HBV = hepatitis B vaccine; IU = international unit; N = number of subjects with available results; VR = vaccine response. Additional exploratory analyses also indicated the non-inferiority of DTPw-HBV/Hib2.5 [Kft] to DTPw-HBV/Hib and DTPw-HBV/Hib2.5 in terms of seroprotection rates to diphtheria, tetanus and HepB antigens and of vaccine response to the pertussis component. Non-inferiority of DTPw-HBV/Hib2.5 [Kft] to DTPw-HBV/Hib2.5 was also demonstrated for antibody GMCs to diphtheria, tetanus, HepB and PRP antigens and for DTPw-HBV/Hib2.5 [Kft] compared to DTPw-HBV/Hib with respect to antibody GMCs to the diphtheria, tetanus and hepatitis B antigens. Pain was the most frequently observed local solicited symptom during the 4-day follow-up period (Figure 2). 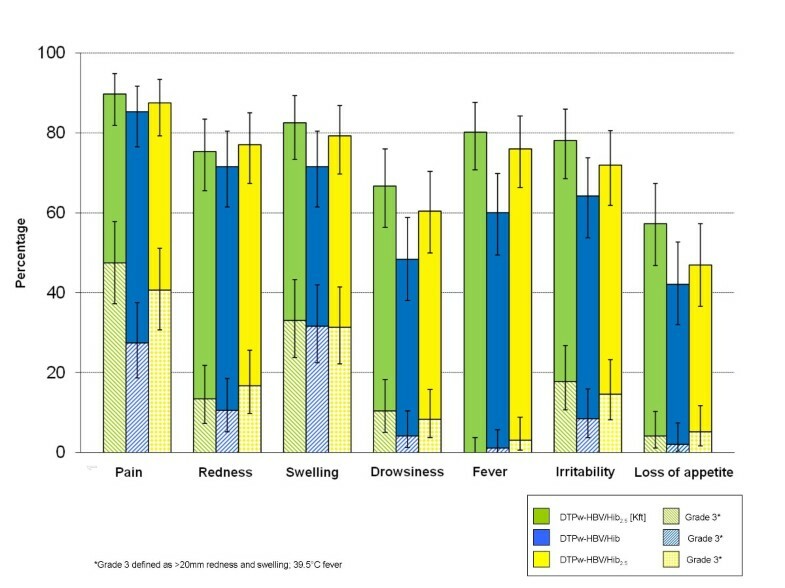 Analysis per subject showed that fever was the most frequently observed solicited general symptom for DTPw-HBV/Hib2.5 [Kft] (80.2%) and DTPw-HBV/Hib2.5 (76.0%) subjects, while irritability was the most frequently observed solicited general symptom for DTPw-HBV/Hib (64.2%). A higher overall incidence of grade 3 adverse events was observed in the DTPw-HBV/Hib2.5 [Kft] group. Incidence of solicited local and general adverse events, within 4 days of vaccination after all doses (Total Vaccinated Cohort). The percentage of subjects reporting at least one unsolicited symptom within the 31 day follow up period after the administration of any vaccination dose was less than 6% in any of the groups. None of the subjects reported grade 3 unsolicited symptoms related to vaccination. No SAEs were reported in any of the groups. Vaccination of Indian infants against diphtheria, tetanus and pertussis is recommended according to the EPI schedule at 6, 10 and 14 weeks . In addition, the Indian Academy of Pediatrics and WHO  recommend a birth dose of HBV to reduce the vertical transmission of hepatitis B to newborns, as well as HBV priming doses at the EPI time points. In 2006, WHO recommended the worldwide incorporation of Haemophilus influenzae type b vaccination into all routine infant immunization programs from as early as possible after 6 weeks of age . In India Hib priming doses at the EPI time points are recommended. Co-administration of multiple antigens in a single injection is widely accepted as beneficial with respect to convenience, compliance and timeliness of vaccination [1, 2, 12]. With respect to the DTPw-HBV-Hib vaccines, many clinical studies have shown that the five antigens can be co-administered without impacting upon the immunogenicity of the individual components . The combination vaccine, DTPw-HBV-Hib, containing 10 μg PRP was licensed for primary and booster immunization of Indian infants in 2000 and has been locally shown to be immunogenic and well tolerated . This trial studied the administration of the DTPw-HBV/Hib2.5 [Kft] vaccine according to the challenging 6-10-14 week EPI schedule, with prior administration of a birth dose of HBV, as recommended locally by the IAP and the WHO. All subjects were seroprotected against Hib, diphtheria, tetanus and HBV one month after the third dose and 97.8% subjects showed a vaccine response to pertussis. These findings are similar to those achieved by the licensed vaccine, and comparable to levels previously reported in studies using these pentavalent vaccines in an Asian population [5, 6, 14–16]. Our study demonstrated DTPw-HBV/Hib2.5 [Kft] to be non-inferior in terms anti-PRP antibody response compared to both DTPw-HBV/Hib vaccine and DTPw-HBV/Hib2.5 vaccine after a three-dose primary vaccination course. However, the anti-PRP GMC point estimate for the comparator DTPw-HB/Hib2.5 vaccine (which, unlike the other 2 vaccines [Tritanrix(tm)-HepB/Hiberix(tm) and Zilbrix-Hib(tm)] used in this study, is not a WHO pre-qualified) vaccine [17, 18] was significantly lower than for the full-content DTPw-HB/Hib. 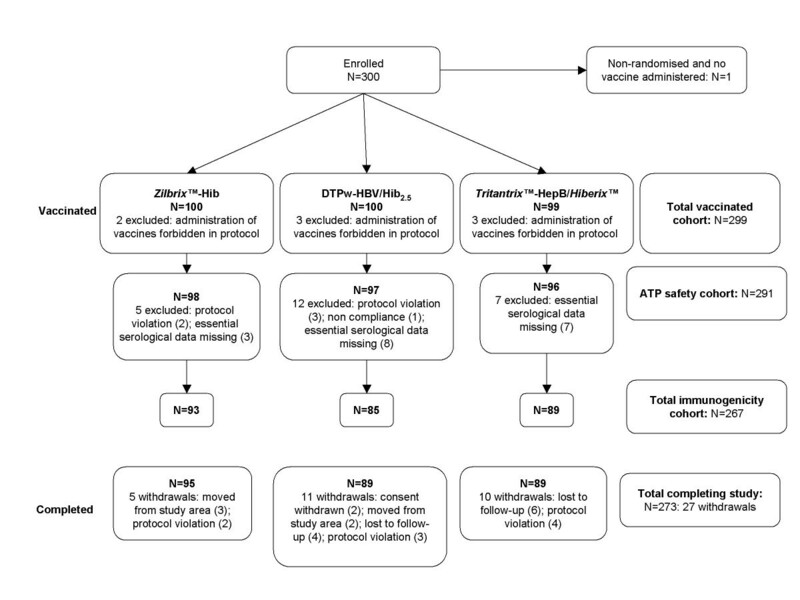 The results from this study agree with previous findings from the Philippines and Latina comparing a DTPw-HB/Hib2.5 vaccine with the licensed vaccine [6, 19] and support the observation that vaccines containing reduced amounts of PRP-tetanus toxoid conjugate generate effective antibody responses and immunological protection [16, 7, 20–26]. The responses to the other antigens of DTPw-HBV/Hib2.5 [Kft] were also found to be within similar 95% confidence intervals as the other vaccines, in terms of seroprotection and vaccine response, further substantiating the non-inferiority of the DTPw-HBV/Hib2.5 [Kft] vaccine to the two comparator vaccines. Overall, the safety profile of the new DTPw-HBV/Hib2.5 [Kft] vaccine appeared to be similar to that of the licensed comparator vaccines and the incidence of symptoms reported was within the range of incidences reported in the literature after DTPw-based combination vaccines . This study was designed to assess primary vaccination at 6, 10 and 14 weeks. In clinical practice an additional booster dose of the vaccine is recommended at 12-18 months. Although a booster was not included in this study, the vaccine was immunogenic (seroprotection above accepted minimum cut-off values) following the primary vaccination course. The non-inferiority analysis was not performed on the PRP cut-off ≥1.0 μg/mL, as the study was not powered for this comparison, although this concentration is regarded as an indicator of long-term protection. Nevertheless, the CIs for the percentage of subjects seroprotected overlapped (at least 94.1% in all groups) indicating that all three vaccines conferred long-term protection. In addition, The Hib immune response to the DTPw-HBV/Hib2.5 [Kft] was similar to that observed with another, WHO prequalified, DTPw-HBV-Hib vaccine administered in a 2-3-4 month schedule . Reduction of the antigen content of the Hib component of DTPw-HBV/Hib and the different formulation of the DTPw-HBV/Hib2.5 [Kft] DTPw antigens did not have any significant effects on the safety, reactogenicity and immunogenicity parameters tested of the combination vaccine when compared to the licensed comparator vaccines. However, further studies need to be carried out to assess any interference on other vaccines, which may be co-administered at the EPI time points, such as rotavirus vaccine or conjugated pneumococcus vaccine. The reduced PRP, new formulation, DTPw-HBV/Hib2.5 [Kft] vaccine was immunogenic and well tolerated when administered according to the EPI schedule to Indian infants. It was also shown to be non-inferior to DTPw-HBV/Hib and DTPw-HBV/Hib2.5 in terms of seroprotection rates to diphtheria, tetanus and HepB antigens and of vaccine response to the pertussis component. The authors would like to acknowledge the contributions of Dr. Dipak Patra, Dr. Anand Prakash and Dr. Vineeta Gupta, who were investigators at the Medical College Kolkata, St John's Medical College Hospital, Bangalore, and Institute of Medical Sciences, Banaras Hindu University, Varanasi, respectively. We also thank Emma Beatty and Julia Donnelly for providing editorial support during the development of this manuscript. Zilbrix, Hiberix and Tritanrix are trademarks of the GlaxoSmithKline group of companies. GlaxoSmithKline Biologicals was the funding source and was involved in all stages of the study conduct and analysis. GSK Biologicals also funded all costs associated with the development and the publishing of the present manuscript. Sanjoy Datta, Jeanne-Marie Jacquet and Alix Collard are all employed by GlaxoSmithKline. The corresponding author had full access to the data and was responsible for submission of the publication.